Salesforce World Tour Amsterdam 2019 was AWESOME! What an amazing day we had! 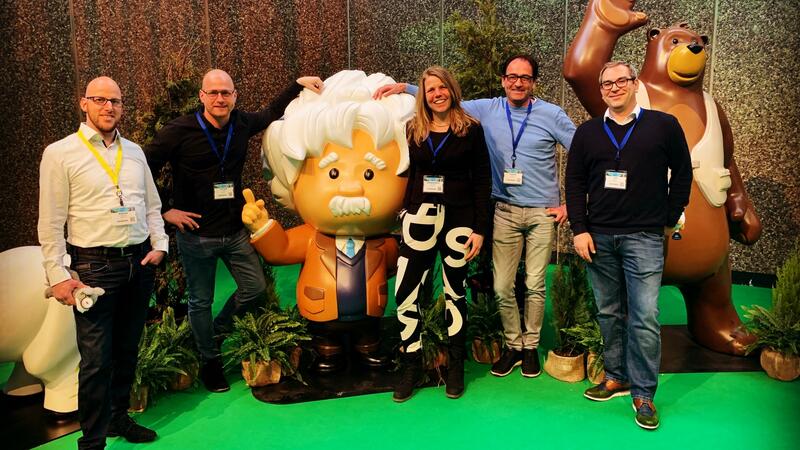 On Wednesday March 7th, together with four colleagues, I attended this annual Salesforce event in the RAI in Amsterdam. Check out this blog about our day at the Salesforce World Tour. Right from the start the event was on fire! 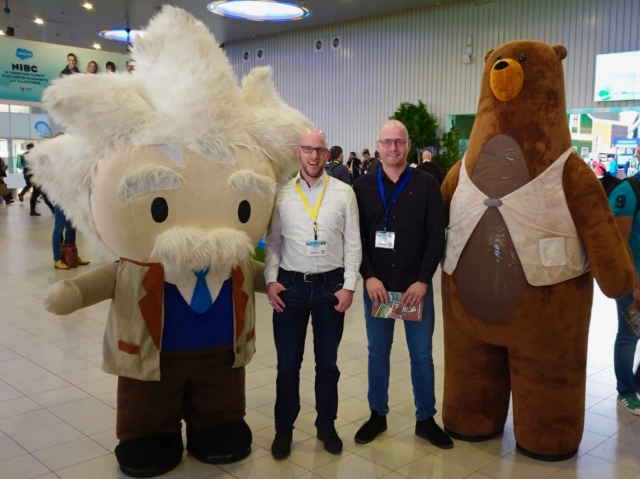 Being welcomed by the well-known Salesforce Trailhead Characters Codey and Einstein, immediately felt like a warm welcome (and of course had to be captured on photo). The Sessions, presentations on various and specific subjects in the main hall that could be followed by the use of headphones, started immediately and the various snacks and drinks were distributed continuously. After walking around for a bit and being positively surprised by the splendid organization and the crowds so early, I soon found two other Nekst IT colleagues. They started questioning my yellow key cord, which was meant for Salesforce Customers, while they had the right blue blue key cord, which was intended for Salesforce Partners. My mistake, but secretly I had the hope for extra goodies. What an opening of the Main Keynote by Slagerij van Kampen (a Dutch drum band)! What a performance and an energy! I felt the adrenaline and enthusiasm rushing through my body after this opening and could not wait for the rest of the program. I can be very critical, so a voice in my head said; ‘after such a great opening act...the rest can only be disappointing'. That voice was proven wrong right away because there followed: ‘A Celebration of Trailblazers’! And what a celebration it was! Host Simon Mulcahy, Chief Innovation Officer at Salesforce, presented very enthusiastic and at the same time in such a calm and pleasant tone, which resulted in me listening to him word for word. He talked about the 'Fourth Industrial Revolution', about Salesforce success stories at Ahold Delhaize and Brunello Cucinelli and also about innovations such as Einstein Voice, a new feature in Salesforce where you can dictate reports and actions just by talking to Salesforce. Presentations, alternated by beautiful short movies which inspired, motivated and made me enthusiastic. I knew for sure: 'I'm going to purchase Salesforce and change the world'! Oh no, that must be the yellow key cord talking, I was not here to buy anything. After the Main Keynote we joined the other two colleagues to chat and discover with each other what all could be experienced at the 'Salesforce campground'. Not soon after, I was again distracted by the different wraps that came along and the different juices that were served. No, no, we were here for the presentations and not the snacks; off to the Sessions! The first smaller presentation we followed was a session about Internet of Things (IoT) applications in Healthcare using Salesforce. The aging population in the Netherlands is growing and the need for care in our country is increasing, while the capacity of health care providers is not. A demo followed and in a playful way, IoT applications and disclosures with Salesforce Health Platform were demonstrated. It is very interesting to see how IoT can contribute in Healthcare, how a patient can be monitored remotely and can be reassured by using video calls when there is reason to do so. Our partner Provar was nekst! At the ‘Salesforce campground’, Geraint Waters presented his vision on (Salesforce) test automation and the possibilities Provar can offer. It was very busy 'around the campfire' and it was good to see that there is a lot of interest for this topic and what a great job our partner Provar is doing. After this presentation we talked with Geraint and made joint plans for the World Tour 2020. IMCD, where I worked with several Nekst IT colleagues on a worldwide Salesforce implementation, presented the highlights of this process during an afternoon session in a duo presentation with Ahold Delhaize. Besides seeing a lot of colleagues which I worked with in this project, it was nice to hear how the managers on behalf of IMCD and Salesforce experienced this complex implementation of Salesforce in 42 countries around the globe. While leaving this session, ‘Blaze’, a plush stuffed animal in the form of a wolf, was distributed to everyone who had followed this session. Yes! My first goodie of the day! Seeing so many familiar faces, this was the start for me to chat the rest of the afternoon. In addition to catching up with many acquaintances I have also been able to meet new people, while I'm really not good at networking. It was great to see that there are a lot of amazing people working with Salesforce! Oh, did I mention that they also served ice cream, potato chips and bitterballen during the afternoon? I attended the Salesforce World Tour Amsterdam 2019 with great pleasure. Thanks Salesforce, for this awesome event! Next year, together with my Nekst IT colleagues, I’ll be attending the Salesforce World Tour 2020 again!